Ansari performed Friday night in Dinkelspiel Auditorium. On Friday night, Stanford got to “treat. 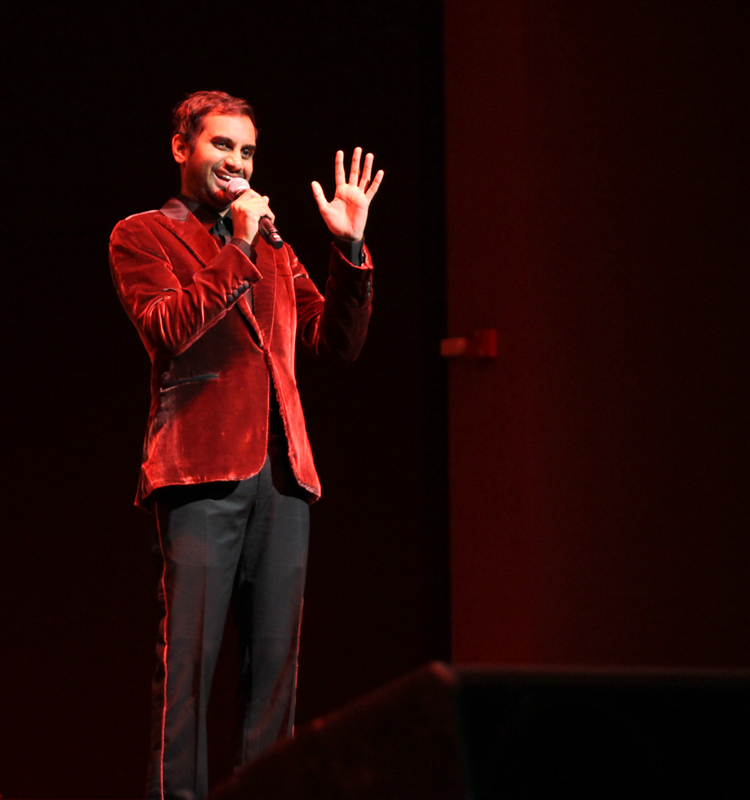 yo’ self,” as Aziz Ansari, donning a red velvet tuxedo, brought his trademark material and delivery to Dinkelspiel Auditorium to an enthralled crowd of mostly undergraduate students. The “Parks and Recreation” star was in the area as a part of his “Modern Romance” tour and fresh off of a Thursday night show at Davies Symphony Hall in San Francisco. Ansari, a consummately modern comedian, focused mostly on the topics of relationships, instant communication, marriage and the culture of dating in the United States. Most of the material was drawn from his personal experiences and those of his friends, as well as those of some audience members. “Now may be the most stressful time ever to be single,” Ansari lamented, describing how text messaging and social media have made sincere communication and intimacy difficult, if not impossible. In between jokes, he waxed philosophical, talking about what he saw as the defining traits of the generation he was a part of, and the generation he was addressing. He addressed a seemingly pathological aversion to commitment (of any sorts) and extensively discussed the culture of texting. He involved members of the audience, soliciting real text conversations students had had with people they had just met. In typical Stanford fashion, the very first participant’s text in the conversation was about a startup (which eventually got Ansari’s seal of approval). Ansari ended the show with an encore consisting of crowd favorites, and some new material from his “Buried Alive” comedy show. The event was the first of what Cardinal Nights – the Office of Alcohol Policy and Education’s (OAPE) alcohol-free programming initiative – hopes will be a marquee event it holds every year, in an effort to improve its programming and host more top-tier events. “I think from last year to this year we are trying to have more of a presence and [host] bigger-scale events,” said Ralph Castro, the director of the Office of Alcohol Policy and Education, in a previous interview with The Daily. According to OAPE Assistant Director Trista Shideler, the event cost about $60,000 and required funding approval from the Undergraduate Senate. The event was not without its share of controversy, however. It was held in Dinkelspiel Auditorium (which has a capacity of 716) as Memorial Auditorium was not available, because of the Ram’s Head Theatrical Society’s preparations for “Les Miserables.” Consequently, there were significantly fewer tickets available than there otherwise could have been. There was also a slight website malfunction due to the excessive demand for the event, with many students unable to see the status of their order properly. Some students were actually able to get tickets many minutes after others believed that they had all been sold out, in a phenomenon that Shideler attributed to a technical glitch. The event was sponsored by Cardinal Nights, the Stanford Speakers’ Bureau and the ASSU. Contact Aaron Sehkri at asekhri ‘at’ stanford ‘dot’ edu.